Stress, fears, pressures—everyone faces them daily. Learn to tame them for real in your daily life. Not another stress management book, this is a revelation of truly peaceful living. 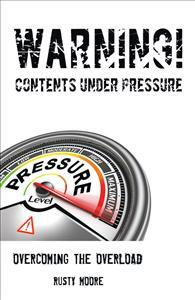 Warning Contents Under Pressure addresses with open honesty the ways in which we tend to bury pressures, anxieties, fears, and troubles that daily confront us all. Our subtle attempts to conceal these toxic distresses only delay the inevitable if not diffused. Though we live in very high-tech times, God is still our loving Father and He very much desires to walk out with us every issue of life every day. Learn the relationship and habits that lead to peace like you’ve never known. You do not have to explode under life’s pressures!